Learn and practice proper care of your cat, including nutrition, grooming, and budgeting cat related care costs. We are currently in need of a countywide Cat Project Leader. 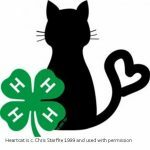 Please contact the 4-H Program Coordinator if you are interested in serving in this capacity.